Here's a smaller and neater alternative to the big and weird default cupcake machine. Having a cupcake machine was a very cute idea, but why it had to be so big and hideous is a mystery. My alternative is more pleasant-looking, has a 4-tile footprint as opposed to the default 9-tile object, a much lower poly count, and uses all the same animations as the original object. It's found in the Small Appliances section in Buy Mode and costs 1000 simoleons. It comes in 10 colours, a mixture of cheerful bright funky colours and neutral ones. Top row from left to right: 1) 'Rust' for your slobby sims, 2) Green, 3) Turquoise, 4) Light Grey, and 5) Caramel. Bottom row from left to right: 6) Sunny Yellow, 7) Light Steel Blue, 8) Red, 9) Lilac, and 10) Dark Slate Grey. The new machine will fit more easily in kitchens, and go better with most decors, than the default one. 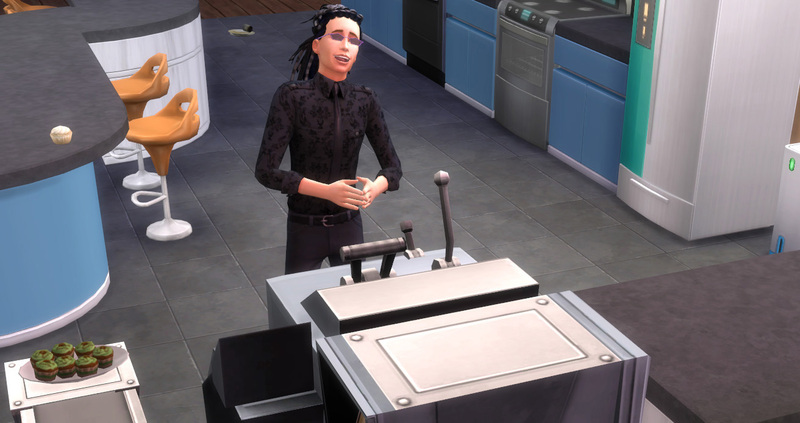 Your simmies will be happier without that big default eyesore! 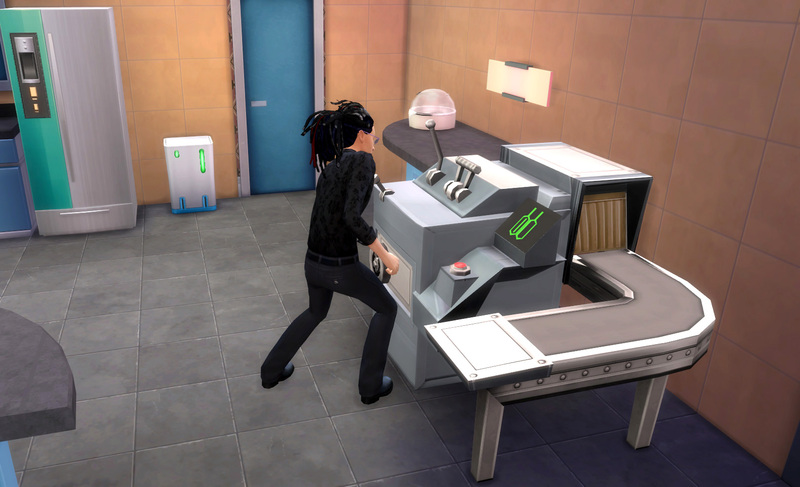 Minor animation issues: When sims do the 'Refill' action they will be emptying the flour bag into thin air due to the removal of the big funnel thing. The 'Clean' action will also be a little off because of my having changed the shape of the front of the item and removed the funnel. NOTE for those who have necrodog's cupcake maker: Necrodog and I were working on our smaller cupcake makers at the same time and comparing notes. If you also have necrodog's little oven, you will know that it's a default replacement and replaces the default cupcake machine's animations with custom ones. You CAN have both of our machines in your game at the same time, though. They will both work and be useable - the only difference is that necro's customs animations will override my machine's animations. As a result, the sim will stand there waiting for the cupcakes to cook while the levers and control wheel operate themselves. When done, the plate of cupcakes will still come down the conveyor belt as per the default animation. Thanks for looking, hope you'll find this useful for your cupcake-loving simmies. Unzip the zip file and move the .package file to your Documents\Electronic Arts\The Sims 4\Mods folder. Made with Sims 4 Studio. A HUGE THANK YOU to andrew from the S4S team for his advice on this item's geostates and all his help and assistance. Thank you to necrodog and plasticbox for advice on getting rid of this item's unwanted FX. Thanks to EA for the original mesh, which I hacked to bits in Blender.